This is a Whopper of an Update! Welcome to the new year! We are so excited about what God wants to do with Cedars moving forward. This is a whopper of an update, so grab your coffee or tea and settle in. We have a great deal to tell you. 1. The All-Church Meeting is scheduled for Sunday night the 20th. We will meet at 6:30pm to talk about where we are currently and what will be happening in the near future. We will be letting you know about such things as budget, vision and important dates in the upcoming year. We will also be letting you know about some exciting staffing news. We want to change the nature of the All-Church Meeting. We want you to see what God is showing our leadership. The staff has been working hard and the elders are leading us to better carry out the vision that was given to Cedars in the first place. Come ready to hear and to then get involved. 2. The Rooted Reunion is set for January 13th at 6:30pm. This is for everyone who has already gone through Rooted as well as those who will be taking Rooted this session. We want to inspire those of you that have already completed Rooted to see what is next for you. There will be worship and testimonies. We think this is going to be a great night. We all will share in a cheesecake bar. Please go to our church website by clicking here to let us know that you are coming. 3. Speaking of Rooted! We are starting our 2019 Winter Session of Rooted with two options for you. Both groups will come to the Rooted reunion on January 13th and then in the last 30 minutes those group members will be excused to meet your Rooted mates and your facilitators. The Sunday night Rooted group will meet from 4:00-6:00pm starting on the 13th. Childcare is available!! The facilitators for this session are Rita Wilson and Sallee Hartbeck. Click here to sign up for the Sunday Rooted Session. The Wednesday night Rooted group will meet from 6:30-8:00 starting on the 16th. The facilitator for this session is Craig Fuller. Click here to sign up for the Wednesday Rooted session. 4. We have Cedars Groups coming. What does that mean? Well, it means that we will have options for groups available to you stating the 13th. We have Men's groups and Women's groups and Bible study groups and groups that will encourage you go deeper. So, what is the difference between a Cedars Group and a small group? Great question! We want to see everyone progress in being equipped to reach their InnerCircle. So these groups, that will run on average 10 weeks, will all have a purpose to help you to get out and reach those 8-15 people whom God has put in your life. We also want to challenge those who attend these groups to do something specific with what they learn. This is not a lake that just gets filled; this is a river that is making a difference in its surroundings. So look through the options and find a group that speaks to you. To see the Group choices, click here. 5. Ladies you have a retreat coming up in February. We are calling this Retreat Abide! It will be held February 22-23 at Cedars Church. The cost is $35.00. You can sign up today by clicking here. 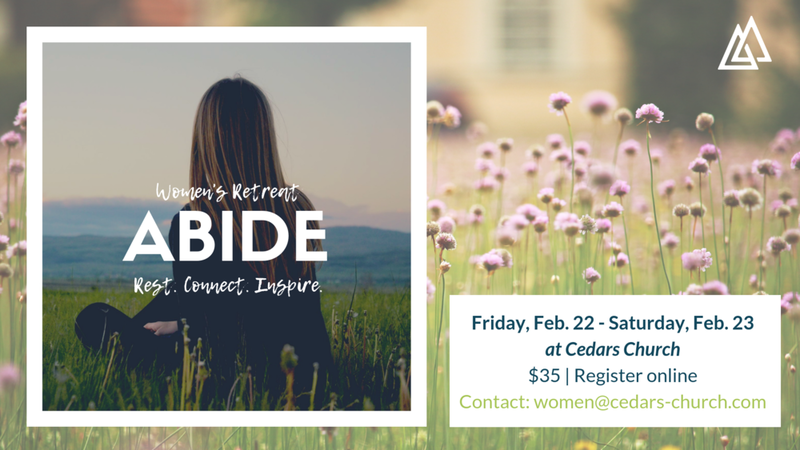 We are excited to see what God will do in the lives of Cedars women as they abide in Christ and use their gifts to reach their InnerCircle. 6. First Steps! Are you new to Cedars? Have you come in the last few months? Do you have questions? Do you want to meet the leadership/staff? Do you want to know more about Cedars and the unique vision God has given the leadership here? Then, First Steps is where you need to be. We want you to learn more and and ask your questions in a relaxed atmosphere. So, this first Sunday of each month we will have a Cedars-sponsored lunch that will meet at 12:30pm here at Cedars. (Except for February Due to the Superbowl, We will meet on the 10th in february. All you have to do to come is click here and we will put out a chair for you. Come and learn what God wants to do with Cedars church and how you can be involved. Our next First Steps class is February 10th at 12:30pm in Room B - Upstairs. 7. A new Internet App: We as a church use a program called Planning Center Online (PCO). This Application allows us to (1) make and communicate to groups, (2) offer the option of charitable giving online and (3) check-in our little ones to Nursery and Sunday School on Sunday mornings. It allows us to do a lot more than that, but you get the gist. Our staff has found an app that allows you to keep connected to Cedars Church. It is a very simple app that is very easy to use. We strongly encourage you to go to the App Store on your IPhone or Android device and look for the app Church Center. Download the app and follow the on-screen prompts that will lead you to Cedars Church. You will be able to update your profile, sign up for events, and look at particular Cedars Groups that will be offered. Also, you can do your charitable giving via this app. So, download Church Center today! Ok…. Put your coffee down and just let all this info sink in, then get involved. It is going to be great! Older PostThis is something BIG!